Some people believe we live in a world that is guided by medications and 'quick fix' treatments. While there may be some truth to this statement, it has to be acknowledged that medicines are important to preserve and improve quality of life and longevity for many people around the world. Still, medicines also come with side-effects – some significant and dangerous – and reducing reliance on medicines can be a positive and beneficial step to improving your health. It isn't to say that all medications should be reduced. In fact, this could be dangerous in itself. However, what it means is that by taking proactive measures, you may find that your physician can reduce your medication dosage or eventually recommend that therapy be halted. Other people may find that an alternative treatment works just as well for their specific health condition. Keeping a stocked up medicine cabinet to deal with health problems is one thing but relying on it when you could make healthy changes to your life is another. If you suspect you might be relying a little too much on your medicines, it might be time to reconsider your lifestyle and the choices that you make for your health. A number of people find alternative treatments can be effective as an addition to pharmaceutical treatment or even as a replacement for drugs. Others will find that their doctor can reduce their dosage of prescription medications because an alternative treatment provides helpful relief. For instance, some people find that St. Johns wort – an herbal product – works well to relieve their symptoms of mild depression. In this case, a natural treatment might be sufficient rather than antidepressant therapy, which works well for many people but does still come with more significant side-effects than St. John's wort. For people who may use over-the-counter pain relievers to handle headaches and similar ailments, relaxation therapies or stress-relieving techniques might help to reduce their reliance on ibuprofen or acetaminophen. Leading a healthy lifestyle is paramount to your commitment to reduce your reliance on medications. A healthy body is one that receives regular exercise and consistently good nutrition. Omitting unhealthy lifestyle practices such as smoking or drinking excessive amounts of alcohol can all help to reduce your reliance on medications. Sometimes, a headache can occur simply from dehydration, which means that you could avoid taking a pain reliever by preventing the headache from occurring in the first place. Some type 2 diabetics can eventually manage their diabetes without drugs by losing weight and partaking in a healthy diet along with regular exercise. You should never take a medication dosage higher than what is stated on your prescription or over-the-counter medication pack. If you find you are often exceeding the recommended doses, you are likely overly reliant on your medications and should also be careful about medication addiction. 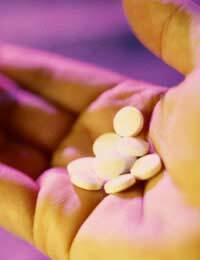 Overuse of medications can lead to withdrawal effects and an entire host of problems. If this describes your current medication use, you should confidentially speak to your doctor about your concerns. Medications are vital life-saving and life-extending treatments that can play an important role in the health of each of us. However, a reliance on medications can mean that we cease to lead a healthy lifestyle and we neglect trying out alternative treatments that can carry less dangerous side-effects and cautions. Speak to your doctor about making some positive and healthy changes to your lifestyle while also considering alternative treatments as part of your medication plan. Your doctor can advise you on how to safely proceed. In your eagerness to make changes or adopt natural treatments, make sure you don't stop taking medications or reduce their doses. In this way, you can safely begin the process of reducing your reliance on medications while still using medications as needed to keep you healthy.